Big news! 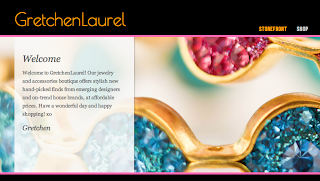 I've started an online jewelry boutique called GretchenLaurel. Each week you'll see my hand selected collection of fabulous, hard to find, styles at up to 60% off. For exclusive access, click below. If you are not interested in purchasing jewelry at this time, you can become your own boutique owner instead! You get to customize your boutique, fill it with products, and write reviews, while earning money in the process. The transactions are all online so all you have to do is pick the pieces you think your customers will love. Your website does the marketing and shipping for you. It's totally flexible, so it fits into your busy schedule. If you're interested or have questions, let me know!